Jonathan Gray’s take on Pres. 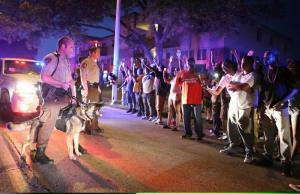 Obama’s failure to use bully-pulpit to change discourse around Ferguson, MO. President Obama held a press conference yesterday to address the ongoing crisis in Iraq and Ferguson. Like many watching and commenting in real time on twitter, I found Obama’s comments on the situation in Ferguson lacking. Ezra Klein attempted to illustrate the source of our frustration: the incredibly polarized political landscape that prevents this president from ‘reaching across the aisle’ and ‘healing the nation.’ Citing Gallup polls and other data, Klein asserts that it is simply beyond this president’s power to bridge not just the divide that colors the way that we respond to racialized policing, but any partisan issue. Still, while he accurately captures the forces that limit the president’s ability to ‘bridge the deep divides in American politics,’ Klein’s analysis ignores another choice that President Obama might have made: to challenge the rhetoric around policing, the logics that produce victims like Mike Brown.